Disruptor companies are rewriting the rules in every industry. Large, established organisations need to create a culture that encourages and executes agility -- or they risk getting left behind. In this issue, discover our latest insight on navigating change and advice for creating agile workplaces in the U.K., France, Spain and Germany. Are You Asking the Right Questions in the New AI Era? Employees must quickly respond to changing business needs now more than ever. 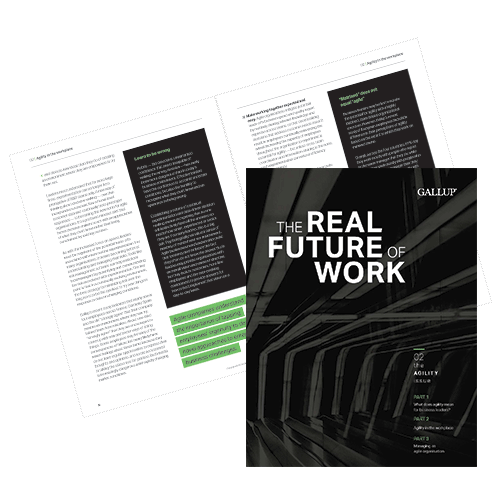 Find out how Gallup can advise you on a people strategy that promotes agility. Use data to understand your employees and predict their future performance. Intel about the future, coming your way.